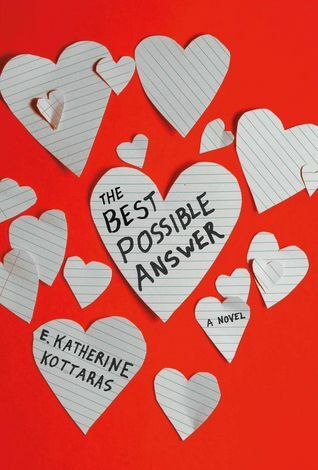 After reading The Best Possible Answer by E. Katherine Kottaras I can safely say I am so glad camera phones and social media weren’t a thing when I was in school, but that’s really only a small part of a much bigger story. Vivianna Rabinowitz-Lowe has her senior year all planned out. She has the SATs to take, a college essay to write, a Stanford application to finalize, and a summer program to attend. At the end of Vivi’s junior year of high school she starts to see a brilliant and bright future dim before her. She’s broken up with her boyfriend, who she trusted with secret photos that went viral and spread throughout the school. Her focus on school has led her to get into a bicycle accident and her doctor has demanded she rest. The accident is just the tip of the iceberg. Vivi’s parents have also seperated. He’s on a business trip to Singapore and Vivi views his departure as being her fault due to the timing. To stay busy, Vivi takes a job working at the pool with her friend Sammie. There she meets Evan, a college-student who starts teaching Vivi that she can trust people again. As they spend time together, Vivi learns something else: that she doesn’t have to be perfect all the time. I have a weakness for perfectionists, but I also detest reading about them. Sometimes the strive for perfection makes the character seem really myopic in their pursuit of their goals and makes it difficult to read their story. I didn’t have this problem with Vivi. Kottaras picks up Vivi’s story at a point where things are really falling apart. Rather than an exposition of Vivi’s goals and dreams we start to follow her during a downward cascade. The snapshots of the future she envisions for herself come in the form of her to-do list and the structure of her life seen in the form of test-taking habbits that appear at the start of each chapter. There is no question that Vivi is a hardworking girl, but she is pushing herself a little too far and that’s what’s leading to the exhaustion and the bicycle addicent in the first chapters. As we follow Vivi home we see how she relates to her mom and little sister, and how she blames herself for her father leaving. It’s a scenario that is easy to sympathize with and it’s one that I find completely relatable. While this book could fit into several categories, The Best Possible Answer is first and foremost a story about growing up and growing pains. Although it has notes of romance and friendship, one of the most important aspects of this novel is the way that Vivi learns to care for herself. She doesn’t do that through the help of a relationship or validation from getting into her top school: she does that by surrounding herself with people who care about her. The biggest question for me, when I leave a young adult book like this is, “What did I come away with?” or “What do I see teenagers coming away with?” In the case of The Best Possible Answer, I found an important lesson on self-care and that things aren’t always what they seem. It’s a story that isn’t perfect, but for teenagers who are growing up, it’s a worthwhile read that puts priorities into perspective. There is a difference between what we should do and what we want to do. Some of us realize that a little late and Vivi’s story is the perfect example of how to come to that conclusion yourself. I am not sure The Best Possible Answer has lasting appeal for an adult audience, but I do think that it’s aimed at the right target audience and that high school students will get a lot out of Vivi’s story. There are several threads in Vivi’s life that weave this tapestry together, and in the interest of not revealing spoilers, I am not going to discuss them, but Vivi’s life feels three dimensional and doesn’t lose that feeling throughout the novel. One of the best things about this book is that it doesn’t have a definitive ending. I prefer when a book ties its threads together and then leaves a few things open for questions and imagination at the end. The end of The Best Possible Answer is satisfying, but sometimes doesn’t feel complete. It’s a snapshot in the character’s life and that is all it is meant to be. Vivi has an existence after high school but it is up to the reader to imagine what that is. And for someone who hated high school themselves, I can’t imagine a better ending for a character who is dealing with some really tough life issues. The plot never resorts to melodramamatic actions, but you still get the sense that this isn’t the best time for Vivi and you want to believe that things can and will get better with whatever shape the future happens to take. The Best Possible Answer is now available in hardcover wherever books are sold. Pick up a copy from Amazon, Barnes & Noble, or your local independent bookseller.